Alfie Kelly, 15, will compete at the 2017 School Games National Finals. 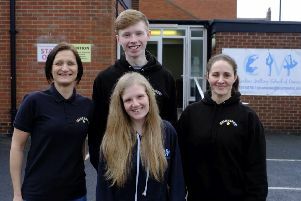 Two Whitley Bay athletes have been selected to be part of the swimming squad at the 2017 School Games National Finals. Will Morris and Alfie Kelly, both 15, will compete for the England North squad at the event. The pair already have an impressive record of success. Will, from Whitley Bay High School and a member of the Tynemouth Swimming Club, has been a British Short Course Championship medallist. Alfie, from St Thomas More RC Academy and trains with Newcastle Swim Team, was a medal winner in the British Summer Championships. Will and Alfie will be hoping to follow in the footsteps of some of Britain’s biggest sporting stars who have competed at the School Games before going on to senior international success. The School Games are an integrated multi-sport event for the UK’s most talented school-age athletes and will take place at Loughborough University from August 31 to September 3. Will and Alfie are hoping to follow in the footsteps of some of Britain’s biggest sporting stars who have competed at the School Games before going on to senior international success. Previous competitors include Paralympic champions Hannah Cockroft, Ellie Simmonds and Jonnie Peacock, as well as Team GB sprinter Adam Gemili. At the event, Will and Alfie will live in a dedicated Athletes’ Village on the Loughborough University campus, take part in an opening ceremony and perform in front of huge crowds of spectators.